Coming into Game 7, the Heat and Spurs were both physically and mentally exhausted after an epic Game 6. The Heat had the momentum after an improbable win and the Spurs were trying to figure out how to come back from a historic collapse in the final minute of Game 6. The Spurs' Tony Parker got the scoring started with a layup off a baseline cut. The Heat responded with a snap pass to LeBron James under the basket which he converted. James would end Game 7 with a total of 37 points and 12 rebounds, enough to win him the Finals MVP title. For James, it was another step toward rarefied air, according to CBSSports.com. Had the Heat lost, James would have fallen to 1-3 in the NBA's championship rounds, and his legion of critics would have been banging on his door with more "He's no Jordan" vitriol, CBSNews.com's sister site reported after the game. Asked after claiming the MVP trophy how he handles the pressure of constant scrutiny from NBA writers and analysts, James simply shrugged it off. "What everybody say about me off the court, don't matter. I ain't got no worries," the star said to applause. The Heat were tight coming into the game as they turned the ball over three times, including one giving the Spurs' Tim Duncan a free path to the basket on a fast break. Mario Chalmers came out shooting again in Game 7 hitting his first shot from just inside the three-point line to bring the Heat back to within two points. Both teams started poorly on offense in the first four minutes of the game as fatigue and nerves looked to get the best of both veteran squads. Miami remained cold from the field and the Spurs capitalized with a Manu Ginobli three-point shot followed by a two-point basket from Kawhi Leonard to open up an 11-4 lead. The Heat started out 2-8 from the field near the halfway point of the first quarter, but were down 11-6 when the first timeout hit with 6:18 to go. Dwyane Wade showed up coming out of the timeout to give the Heat a quick four points to help narrow the lead to just three points before Boris Diaw hit a wide-open layup to give the Spurs a 15-10 lead. Both teams struggled mightily in the first quarter with San Antonio shooting poorly and the Heat turning the ball over and over. With two minutes left in the first quarter, the Spurs were shooting just 35 percent from the field, but the Heat couldn't capitalize as Miami was shooting 31 percent from the field. The Heat were able to tie the game with just over a minute left in the quarter when the Birdman Chris Andersen got an offensive rebound and tip-in to tie the game at 15. The Heat took its first lead of the game when Shane Battier hit his second three-pointer of the quarter. At the end of the first quarter, the Heat held an 18-16 lead over San Antonio. The Spurs were shooting just 32 percent from the field in the quarter and 25 percent from behind the three-point line. Miami was just barely better at 37 percent from the field, but 50 percent from deep. Battier continued his hot shooting in the second quarter and extended the Heat's lead to five points until Tony Parker finally cooled off the Heat's run. Parker followed up a Miami turnover by hitting a wide-open Tiago Spliter to help close the Heat lead to just one point before Heat head coach Erik Spoelstra took a timeout with just less than ten minutes to go in the half. The Heat then pulled down three straight offensive rebounds before Mario Chalmers hit a twisting layup and Wade followed that with a big blocked shot on the defensive end. After exchanging baskets, LeBron hit a circus-style layup and converted the free throw after a foul. He followed that up with a three-point shot to increase the Heat's lead to 33-27. After a Spurs three, Chalmers came back with a mid-range jump shot to increase the Heat's lead back to five points with just over four minutes to go in the half, 37-32. LeBron came through with another three-point shot with just a little more than 2:30 minutes to go to increase the lead to 40-38 before the Ducan hit a pair of free throws to close the game to just two point, 40-38. After a missed LeBron three-pointer, Duncan hit a layup and just like that the game was tied at 40. Wade would end the scoring in the first half, hitting a basket to give him 14 points in the half to go with 6 rebounds. LeBron contributed 15 points on 5-11 shooting in the half. The Heat led the Spurs 46-44 halfway through Game 7 of the 2013 NBA Finals. Miami shot far more three-point shots, but was sorely beaten at the free throw line. The Spurs hit 14-15 from the free throw line to Miami's 3-3. But it wasn't an issue of refereeing as much as it was Miami's lack of ability to get inside to draw fouls on the drive to the basket. The biggest mystery of the first half was the disappearance of Chris Bosh. The team's center played only 10 minutes in the first half of the game. Coming out into the second half, both teams exchanged baskets and the Heat managed to keep the lead after LeBron hit a completely wide-open three point shot. After three minutes in the third quarter, Miami led the Spurs 52-50, but had no answer for Kawhi Leonard in the half. Again though, Bosh remained invisible on the offensive end going scoreless through the game's first 28 minutes. If Miami was going to pull away from the Spurs, Bosh had to get his game going soon for the Heat. After the score was tied at 54, Wade finally gave the lead back to Miami with a jump shot, but Danny Green finally hit a three-point shot and put the Spurs back up by one 57-56. Heat head coach Erik Spoelstra had probably the most curious coaching decision of the game by keeping Shane Battier out of the game for much of the second and third quarters. A LeBron three-point shot put Miami back up on top by a 59-57 margin with 3:45 to go in the game. James then hit another three on the next possession to push the lead to 62-57. But after giving baskets to each other, Boris Diaw hit a three-pointer and on the next possession found Duncan down low for an easy basket to give the Spurs a 65-64 lead with two and a half minutes to go in the quarter. The teams exchanged basket after basket until Manu Ginobli hit a running layup to give the Spurs a two-point lead, 71-69. Then Chalmers put the exclamation point on the quarter by hitting a bank shot three-pointer to give the Heat the lead 72-71 heading into the final quarter of the NBA season. Battier started the fourth quarter scoring with his fifth three-pointer of the game to extend the Heat's lead to 75-71. After more buckets were exchanged, LeBron hit a free throw to give the Heat a 77-73 lead with 9:18 to go in the game. The Spurs followed the possession with a turnover and the Heat responded with a missed three-pointer by Battier and Tim Duncan hit an easy lay-up to get back within two points of the Heat, 77-75 with 8:34 to go in the final game of the season. 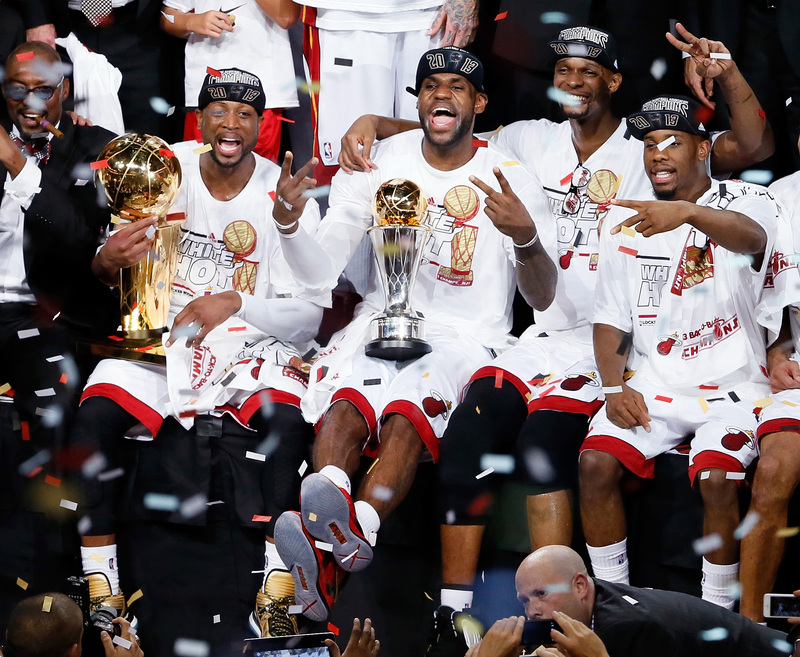 The game was looking like it could come down to which team had the ball for the final possession and it was the perfect cap to an exciting 2012-2013 NBA Season. As the clock went below seven minutes to go, the Heat led by six points before a Bosh moving screen foul turned the ball back over to the Spurs and Ginobli hit a running layup to bring the Spurs back to within four points, 81-77. LeBron got his 30th and 31st point with a jump shot over Duncan to push the lead to 83-77 with just 5:37 to go in the game. San Antonio missed another shot on the offensive end and committed a quick foul. The Spurs came right back and Tim Duncan got to the free throw line for two clutch free throws to get the lead down to 83-79. Just like he had done all game, LeBron came right back and hit a jumper to get the Heat to 85 points and an 85-82 lead. Shane Battier came back with a corner three-point shot that was quickly answered by Duncan with a circus bank shot and a free throw to close the lead to 88-85 with three minutes to go in Game 7. Battier hit a bounce pass to Wade who hit a falling away layup to increase the lead to five points, 90-85 with two minutes to go in the game. As the clock wound down to 90 seconds in the game, the Heat clung to a 90-88 lead. Duncan missed a point-blank shot at the offensive end and LeBron pulled down the rebound and the Heat had the ball, up two points, with just 39 seconds to go in the game. LeBron then hit another jump shot to give him 35 points in the game and more importantly give the Heat a four-point lead with just 27 seconds left to go in the NBA season.